the 2018 Outstanding Business Citizen Award the 2018 Community Service Scholarship. Nomination forms and scholarship applications can be found on the events page. The deadline to nominate or apply for an award is November 30th. Paula Martel of North Easton Machine has been selected as the 2017 Outstanding Business Citizen of the Year. Paula has dedicated much time and effort to the Easton STEAM Education Team to develop and implement programs, including securing volunteers and funds. She has been an advocate in creating partnerships with area business and non-profits to support the STEAM mission. As an active employee of North Easton Machine Co., she continually seeks engagement of its employees and support of other programs in the area that involve youth development. Carrie Camara of Oliver Ames High School, has been selected for the Community Service Scholarship. She is an active volunteer with Old Colony Hospice and has assisted with fundraising events for the past three years. The deadline to nominate or apply for an award is Monday, December 4, 2017. The Children’s Museum in Easton, along with their sponsors and friends, is proud to present the 4th Annual Night at the “Brewseum” – A Craft Beer & Food Expo on Saturday, August 12, 2017 from 4:00 – 7:00 pm at the Children’s Museum in Easton, in the heart of Easton’s exciting and historic downtown district. This “adult only” fundraiser will feature tastings of local and regional craft beers and ciders, fabulous tastings from local restaurants, and live music all evening long from Boston’s own Wolfpack Band. All proceeds benefit the exhibits and educational programs of The Children’s Museum in Easton. For more information on this event, visit the Museum website. These sessions offer an excellent opportunity to express your concerns and offer suggestions to the state’s economic development policy. For all locations and registration information, click here. 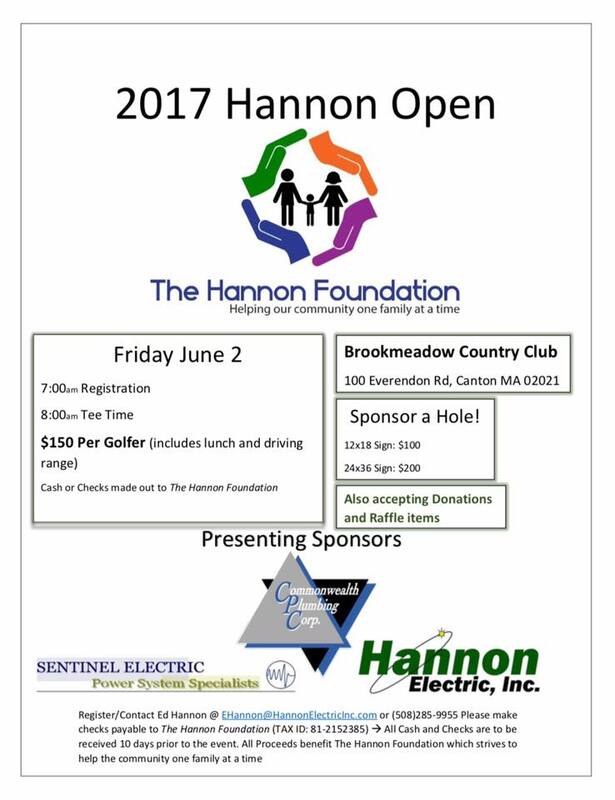 2017 Hannon Open – Sponsorships available! The Hannon Foundation’s major annual fundraiser, the golf tournament, enables them to help our community one family at a time. In record time, 10 days to be exact, the Hannon Open golf tournament filled to capacity! It’s sure to be a great day on June 2nd at Brookmeadow Country Club! Hole Sponsors are essential to a successful tournament and your business or family can participate! Your support as a major sponsor, donor or volunteer ensures that they’re able to assist a family who’s been impacted financially by the loss of a parent’s job or the medical condition of a family member. For more information on how you can help, email info@hannonelectricinc.com or view attached flyer. Thomas A. Deubler, President and CEO of North Easton Savings Bank has been selected as the recipient of the 2016 Outstanding Business Citizen Award. For over 30 years Deubler has played an integral role in the growth and success of the bank, and under his leadership he has encouraged every bank employee to volunteer and serve their community. He has also advocated for the financial support of numerous non-profits in town as well has dedicated countless hours of his own time serving these organizations. The recipient of the 2016 Community Service Scholarship is Anna L. Nelson of Oliver Ames High School. This award is given to a high school senior to recognize a service project that has positively impacted the local community and its citizens. Nelson will be recognized for her years of volunteerism at School on Wheels of Massachusetts. Both awards will be presented at the Chamber’s annual Business Appreciation Night on January 26. The chamber is excited to announce it just launched a new online application and payment option to the website. New members can join and current members can renew online. See the drop-down menu under Membership. Outstanding Business Citizen Award – nomination form. Community Service Scholarship – application form. The deadline to nominate or apply for an award is Monday, December 5, 2016. American Pickers are coming to Massachusetts! The site is designed to showcase Easton as a great place to do business. With the support of Easton’s Economic Development Council, the Town is happy to announce the release of a new community highlight video series, viewable on the home page at www.easton.ma.us – this series highlights many of the amenities that make Easton a great place to live, work, and visit! from 6-8:30 pm! Tickets go on sale April 25. Buy tickets early, the event usually sells out. Check out the Winter Newsletter! The chamber is pleased to announce the guest speaker for the Business Appreciation Night scheduled for January 28, 2016 at the Easton Club. Kristi Marsh is a Celebrated National Speaker & Award Winning Author who is passionate, uplifting and inspirational. She is an eco-health speaker leading the movement for healthier bodies, homes and work environments. She has present at a press conference in Washington D.C., received a letter for the First Lady, and shared GMO education on a worldwide webinar. Her book, Little Changes, was selected as the 2014 Evergreen Gold Medal for being a ‘world-changing’ book of this millennium. Visit her website for more insight. Nomination forms are available for the Outstanding Business Citizen Award and Scholarship applications for the Community Service Scholarship. The deadline for submission is Monday, December 7, 2015. Both recipients will be honored at the annual Business Appreciation Night being held on Thursday, January 28, 2016. Mangia Neapolitan Pizzeria is celebrating their 1-year work anniversary and would like to offer Easton chamber members 50% off their next office-wide lunch. Please call them at 508-285-4400 at least 1-day in advance to place your order. Delivery is available. This offer expires November 15, 2015. Easton Community Access Television has partnered with the Chamber on a new cable program that will spotlight a local business each month. The Chamber’s own Gail Devins, of Shoo Geese! Border Patrol will serve as the host of the show and will interview the businesses. The Chamber will kick-off their first segment at the Easton Country Club in September, and its expected to air in October. Easton Chamber of Commerce members can sign up for a monthly spotlight through the chamber office by phone or email. The Chamber has once again partnered with My Hometown Map to provide an Easton map. The maps will be direct mailed to every household in town, reaching over 22,000 residents.My Hometown Map is an experienced publisher that has partnered with many chambers to make maps in print and online. There are some great advertising opportunities for area businesses, and discounted ads available to Easton Chamber members. Check out their website to see some online local area maps and ads. For more information please call Jerry Saval at 508-930-7065 or email jsaval@myhometownmap.com. HarborOne Bank is excited to renew ten college scholarships of $1,000 each for the upcoming academic year to deserving high school seniors who embody a commitment to community and academic excellence. Attached is a copy of the application with further details for your reference. In addition, the application can be found on the banks website – select scholarship. On February 12, 2015 the Board of Directors of the Easton Chamber of Commerce unanimously voted to endorse the Small Business Bill of Rights as authored by State Representative Shaunna O’Connell – Third Bristol District, Taunton & Easton. Click here for more information. Invoices for 2015 Membership Dues were mailed to all members on December 10. Payment is requested by January 31, 2015 to keep one’s membership in good standing. If payment is postmarked by January 2, deduct $20. If a current members refers a business to join the Chamber before January 31, 2015, they receive a $50 credit towards their 2015 membership dues. On June 9, 2014, the Board of Selectmen approved a charge for the Economic Development Council of Easton. The council charge is available here.This Council is tasked with the promotion of sustainable economic development of the Town of Easton through collaboration with neighborhoods, businesses, and regional governments to create employment opportunities and sustainable growth.Membership of this Council is composed as follows:Seven (7) persons appointed by the Board of Selectmen consisting of: two (2) Board of Selectmen members, the Town Administrator, and (4) private sector appointees chosen from a pool of candidates who applied for a seat on the council. The Easton Chamber of Commerce office has moved. See page footer or Contact Us for location information.